Yeats’ writing addressed not only the Irish situation but, drawing upon the mythology of the world, his poetic scalpel dissected global issues. Yeats in his time also saw Ireland as an accessible model of the world’s situation. Today is an important day. 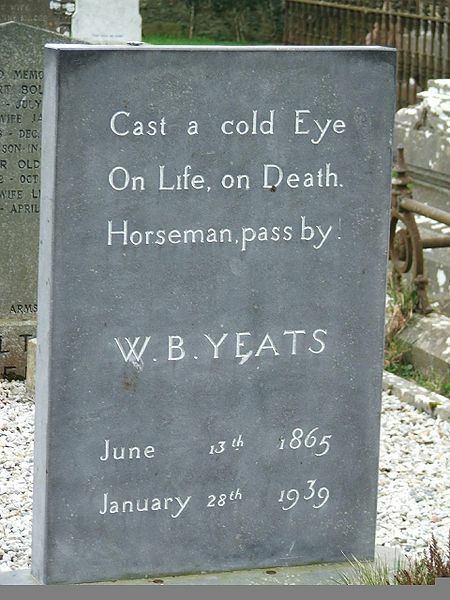 All this week we in Ireland have been celebrating, talking and thinking about his work, but today, Saturday 13th June, 2015 is the 150th anniversary of the birth of William Butler Yeats. I make no pretensions to be a poet, and when the truth is told, I struggle to feel the unwritten power between the lines of any poet’s work. But for some reason I cannot explain, I have always been drawn to the work of Yeats. I have no difficulty even now, three score years after I sat in my secondary school desk, in remembering the poems of Yeats, and in moments of doubt and trepidation it is strange how easily his words slip quietly into my mind. Yeat was an Irish poet, a Nobel Laureate and one of the four such Laureates about whom our small country, but great nation, boasts. Yeats’ writing addressed not only the Irish situation but, drawing upon the mythology of the world, his poetic scalpel dissected global issues. In particular, I sense that his comments upon the emerging Irish State in the early 1900s, are still fresh and true, not only about Ireland today, but they also give us a poet’s insight into the universality of the human condition. Sir James G. Frazer described Magic and Religion as a cultural story or a dream-world within which human beings live their lives. Again violence was a central warp thread in the story that he wove.